President Nana Addo Dankwa Akufo-Addo has officially reinstated the Deputy Sports Minister, Pius Enam Hadzide and the Chairperson of the National Sports Authority Kwadwo Baah Agyemang following the completion of the investigation into the visa fraud and racketeering which led to the deportation of about 60 persons from Australia. The duo was suspended over their alleged involvement in a visa scandal during the Commonwealth Games in April where some 60 persons were arrested and repatriated for bearing false identities. According to reports, some officials from the National Sports Authority as well as the ministry facilitated the fraudulent visa acquisitions for them. Embarrassed by the development, President Akufo-Addo asked the officials to step aside and constituted investigations into the allegations. 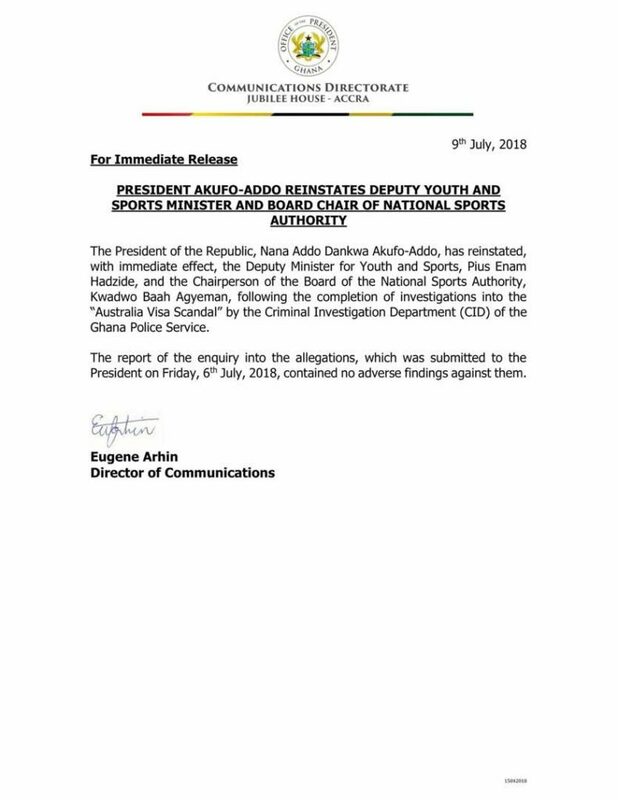 But in a statement released on Monday, the President said following the investigations, both Pius and Kwadwo Baah have been exonerated.